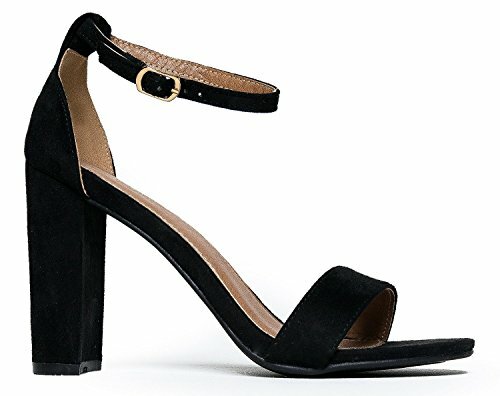 These classic heels feature a sleek ankle strap and a block heel to add comfort and style to your everyday look. A must-have in every girl¡¯s closet! 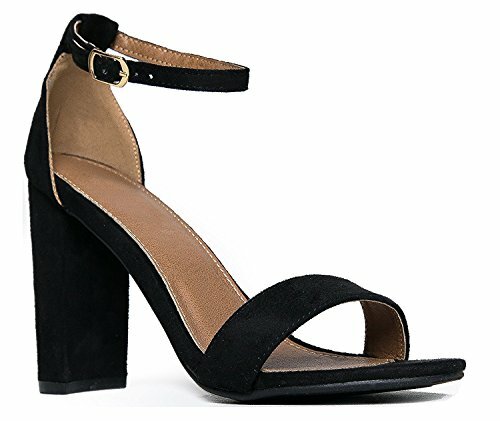 Heel measures approximately 3.75 inches" Classic design that is sure to compliment every modern woman's wardrobe. Update your personal style with a touch of color - or a flashy, colorful hue - by purchasing this pair of heels that will last for all memories! This stunning pair of heels is ideal for weddings, parties and every other special occasion that calls for dressy, upscale shoes! These Ankle Strap High Heels are the perfect pair to add a few inches to your frame, elongate your legs and rock every dress, denim jean, or maxi with ease! Featuring a cute strap that hugs your ankle for custom support and provides a comfort throughout wear. Your feet will not slip, turn or move out of place while wearing these gorgeous heels! Heeled shoes don't have to feature thick, heavy soles to be comfortable or safe to wear! This pair is perfectly designed for steady steps, as it features a single, slim sole that ideally balances the heel height with the rest of the sleek shoe design.